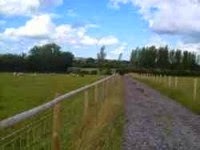 Two Counties Farm is a camping and caravanning site in Mere, Wiltshire. The campsite is family owned and run by Eric & Pauline Mitchell, there is much to see and do including fishing, golf driving range and camping. Two Counties Farm is the perfect location for a peaceful break. All pets are welcome. Electric points are available, and bottled gas is available to buy locally. Cold water taps freely available with a new toilet and shower blocks. Two Counties Farm is also moments away from historic destination Stonehenge and infamous landscapes of Stourhead and Longleat. There are 2 fishing lakes on the campsite, the larger lake has 26 stands and is well stocked with a variety fish including Carp, Roach, Bream, Perch, Tench, Crusians and Orfs. The smaller lake has 6 stands and is stocked with a good concentration of Tench and Crusians.